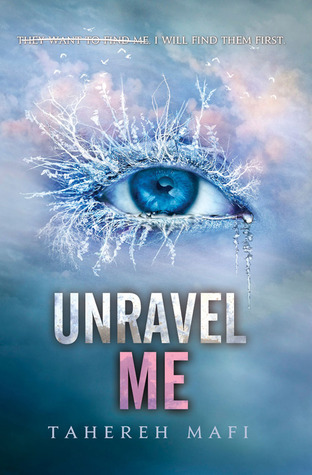 In this exhilarating sequel to Shatter Me, Juliette has to make life - changing decisions between what she wants and what she thinks is right. Decisions that might involve choosing between her heart - and Adam's life. Juliette's touch is lethal. She has never felt loved, wanted or desired, until she met Adam. The former rebellious soldier of Warner's army division. Warner, the boy who has breathed and studied Juliette for years. He want's revenge, he wants Juliette. The story begins where Shatter Me, the first novel in the series, left readers. Juliette and Adam are now members of the resistance at Omega Point. Preparing for an assault from the Reestablishment army and The Supreme Commander's ruling hand, Juliette is trying to master her curse gift... With little success. She feels as though she is still being held against her will. She now barely sees Adam. Adam is undergoing testing in the hope to understand his abilities, his immunity to Juliette's lethal touch could only mean that he too is cursed blessed. Right? With the army increasing manpower and patrols, the movement know that time us running out, and quickly. Warner lives for Juliette, the most exquisite, yet deadly creature he's ever met. He must have her. Compound citizens are being killed for protesting and there is steadily growing unrest towards the reestablishment. But when four gifted team members are taken hostage. It's now or never. Juliette is ready, but with two men that would give their lives for her, she's conflicted. Two polar opposites, one a freedom fighter, the other thrives on the emotionless, oppressive regime. Both can touch her it shouldn't be possible it is possible. Revelations will blow their world apart. I am officially in love with Tahereh Mafi. Tahereh isn't a writer, she's a storyteller, she's a poet, she creates entire worlds where the reader can live, she's brilliant. I've never come across an inner monologue even close to that of the character of Juliette. It's purely poetic. Taherah can describe one emotion with paragraphs of random descriptions, shrieking tea kettles, being able to capture minutes ticking by in your pocket, I am scared, I am scared, I am scared, I am strong. It's quirky and poetic and captures Juliette with an amazing inner monologue. That originality wont sit well with everyone, but the strike through text, the short clipped lines and poetic descriptions are incredible. I've never read anything remotely similar. There are no awkward pauses and it's writen with such beauty. I read the entire book in one sitting, I devoured it and couldn't put it down.